The holiday season is close and I what I love most about it is the amazing smell of spices in my kitchen when I bake something. Cinnamon is probably my favorite spice and in combination with apples and coconut sugar, it just tastes heavenly. 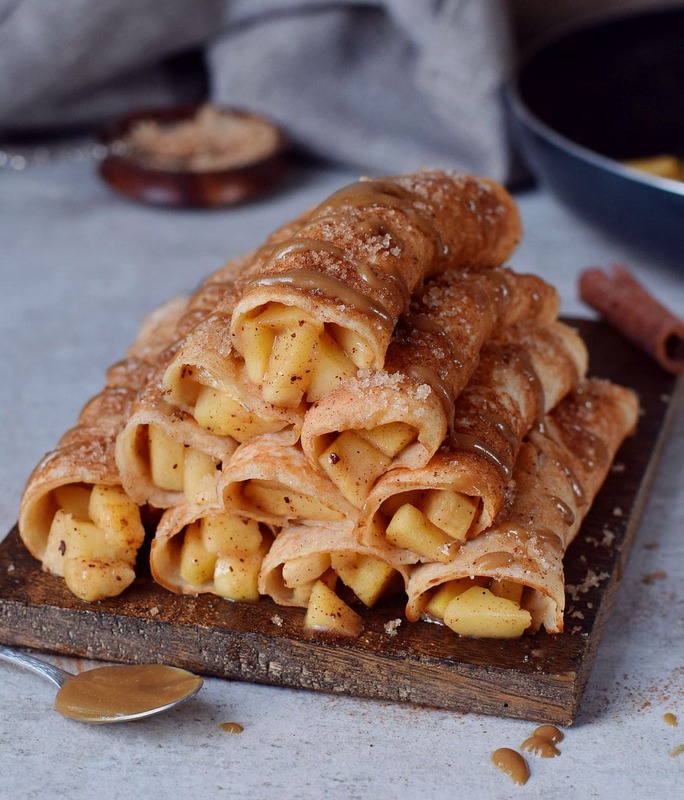 That’s why I had to make these delicious apple cinnamon crepes which are seriously a must-have dessert for fall and the holiday season. 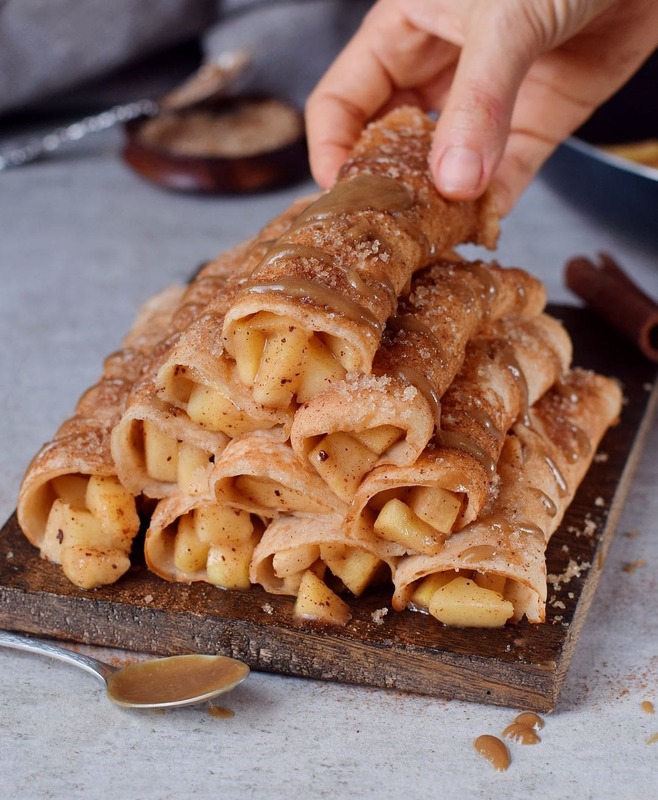 These delicious apple cinnamon crepes with a caramel sauce are vegan, gluten-free and easy to make. They can be made for breakfast or dessert. I don’t mind having them for dinner either because they are just so yummy, haha. 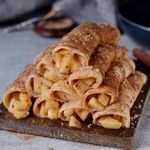 If you are tired of eating pancakes with PB & Jelly and want to try something new then give these vegan apple crêpes a try. To make the crepes gluten-free I’ve used rice flour and gluten-free oats. You can use regular oats and all-purpose flour instead of rice flour if you don’t have a problem with gluten. To make your own oat flour simply process oats in a blender, food processor or in an electric coffee/spice grinder. I love using this small grinder which works absolutely amazing and doesn’t cost much! The filling consists of sweet apples, cinnamon, coconut sugar, lemon juice and a little bit of cornstarch. You could also add raisins, rum extract, and vanilla extract if you like. Pumpkin spice or allspice is also a nice addition. You simply need to chop the apples, add all ingredients to a pan or skillet and let it simmer for a few minutes. 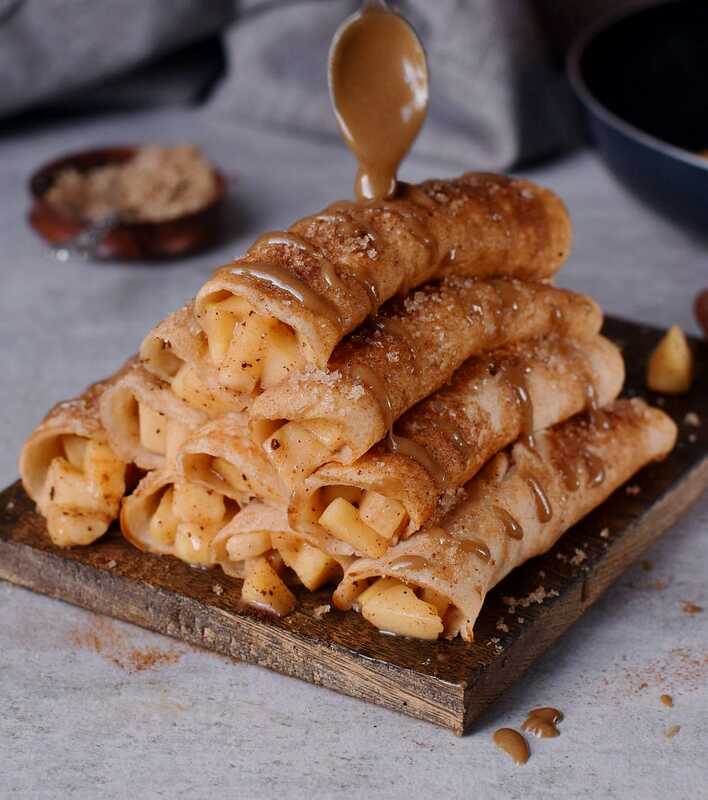 I love to eat these apple cinnamon crepes with a drizzle of homemade caramel sauce which literally just has 3 ingredients! They are coconut sugar (you can use brown sugar), water and nut butter of choice. I actually used sunflower seed butter but any nut butter will work. Check the recipe notes to find out how I made it. Should you recreate my recipe, please leave a comment below and don’t forget to tag me in your Instagram or Facebook post with @elavegan and #elavegan because I love to see your recreations. If you are looking for more fall desserts, then definitely also try out my vegan apple pie. 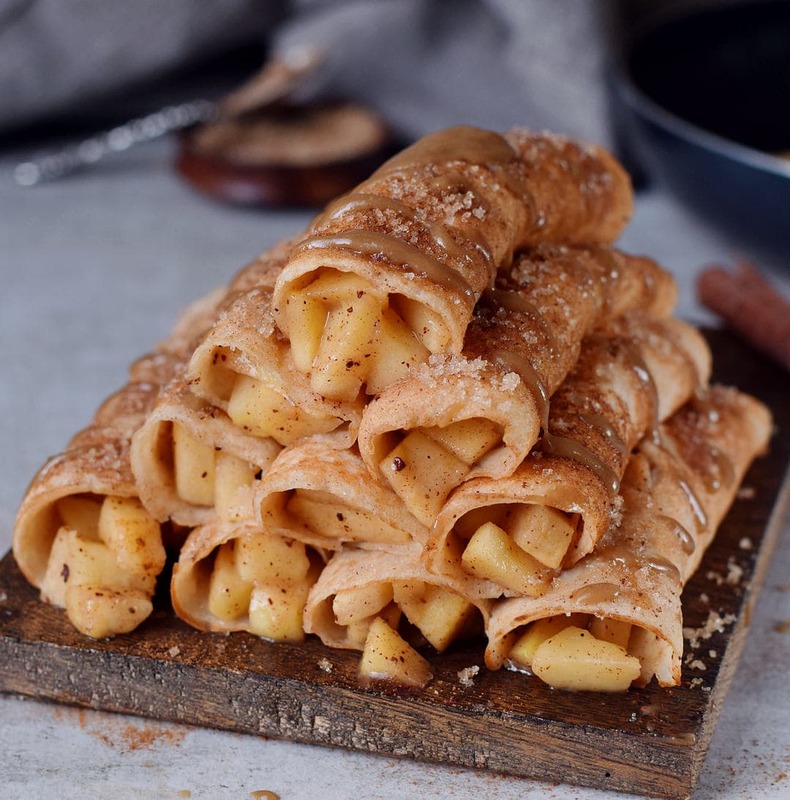 These apple cinnamon crepes are perfect for the holiday season. The recipe is vegan, gluten-free and easy to make. Tastes best with a caramel sauce or vanilla sauce. The recipe has been recently slightly updated/improved. Let the batter rest for 5 minutes. Heat a little bit oil in a small/medium sized non-stick skillet (mine has an inside diameter of 5 1/2 inches). Pour 1/4 cup of the batter into the skillet, swirl the batter around to coat the pan evenly. Cook for about 2-4 minutes or until you can easily lift a side of the crepe (don't try to flip the crepe too early). After you flipped the crepe, cook for a further 1-2 minutes. After a while, the batter will get thicker, so you might need to add a splash of milk. Continue until you have no batter left. To make the apple filling, put all ingredients in a skillet, stir and let simmer for a few minutes over low/medium heat. 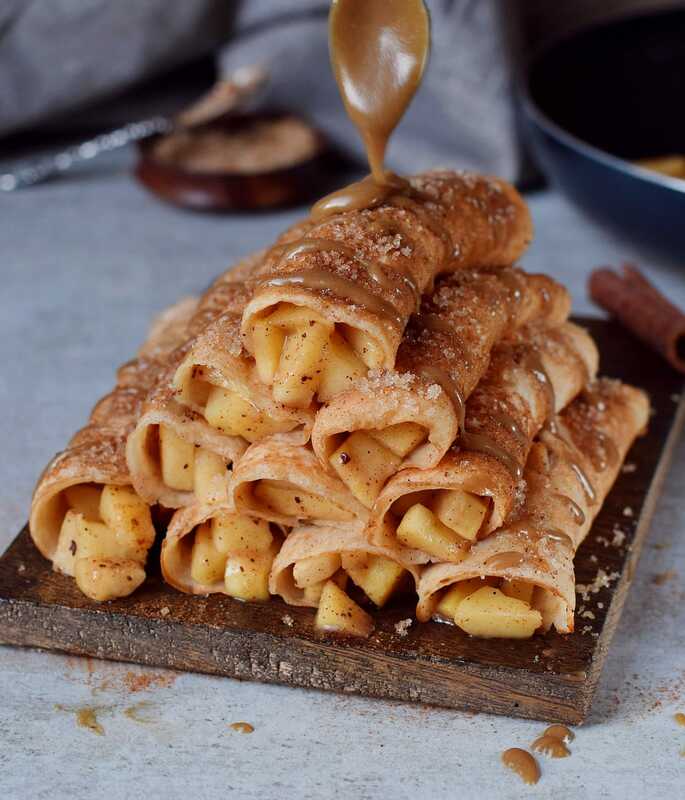 Add a few tsp of filling on each crepe, roll it up and serve with a drizzle of caramel sauce (see recipe below). Enjoy! You can use regular oats or gluten-free oats. To make oat flour, simply process the oats in a blender or in an electric coffee/spice grinder. Instead of rice flour, you can use any other flour e.g. buckwheat flour, quinoa flour, even all-purpose flour (if not gluten-free). Do not use coconut flour though as it's very absorbent. Add peanut butter to a small bowl. Heat water and sugar in a pan and bring to a boil. I have to try this today. Thanks for always thinking of everyone. It’s nice to have options with but allergies while being vegan ,fairy free and gluten free,at the same time.. If you have a nut allergy just make your caramel with coconut cream, it’ll be extra delicious! 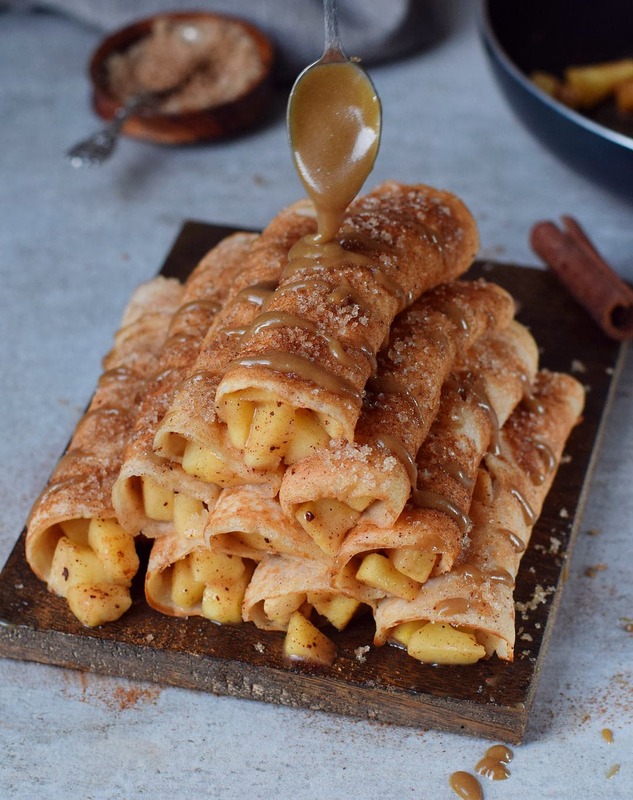 Hi, is the crepe rolled in cinnamon and sugar before putting drizzled Carmel? They look super delicious, my dear Ela! You know, I also love Apple cinnamon flavors! ???? Thank you, Bianca! 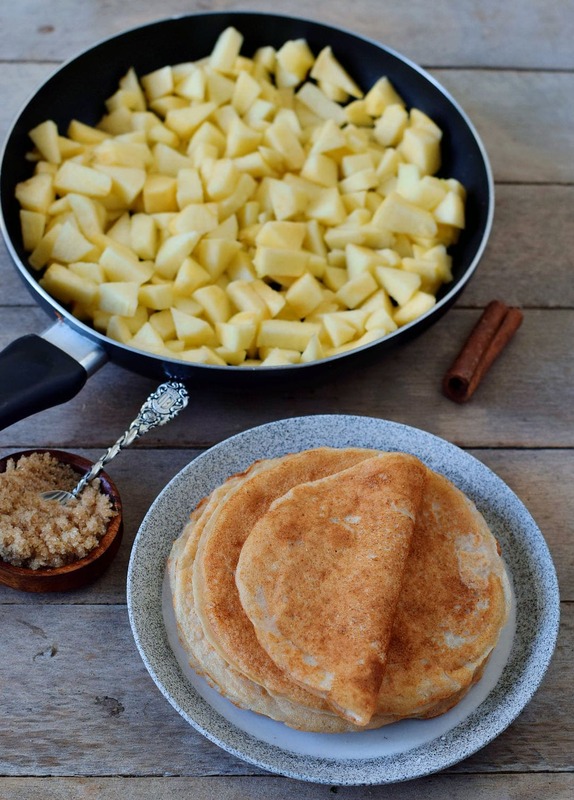 Yes, apple cinnamon is the best combo ever. Can the crepes be made ahead of time and frozen? Can we omit the flax or chia seeds.? If not, what can I substitute instead.? A wintery day here in Canada, so I decided to cook, bake and make your crepes. It urned out to be the best idea for today. The crepes are so good and satisfying for that sweet graving. 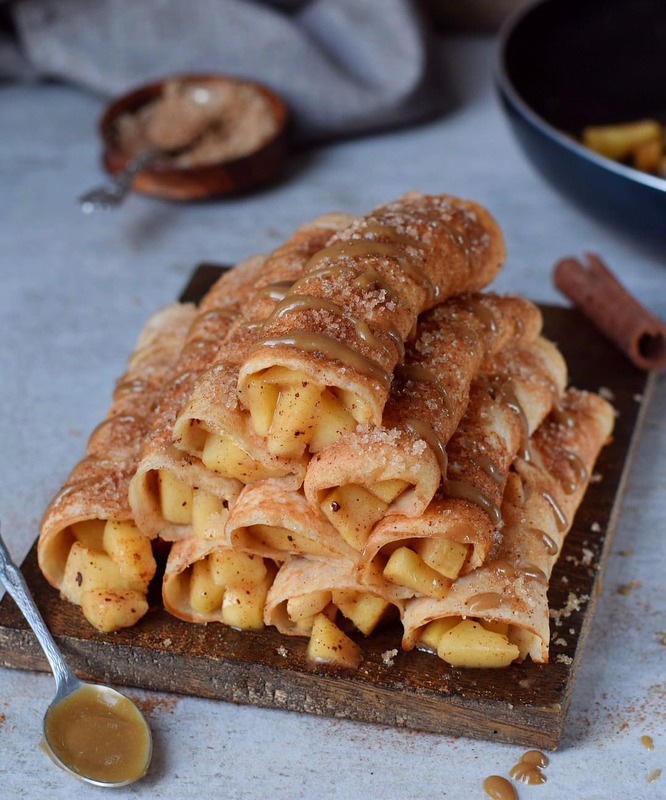 We ate the dessert/crepes first , because we couldn’t resist that warm apple/cinnamon smell and now we’re not hungry anymore for lunch.. haha.. Tolles Rezept, vielen lieben Dank. Awesome, Heike! I am so glad you enjoyed them! This looks sooo good! Do you think this recipe would work well using chickpea flour? Sorry to hear they turned out brittle. I made the recipe many times and they always turned out elastic and not brittle at all. Did you measure the ingredients in grams? I’m in love with these??????????????? ?will Definately try it!